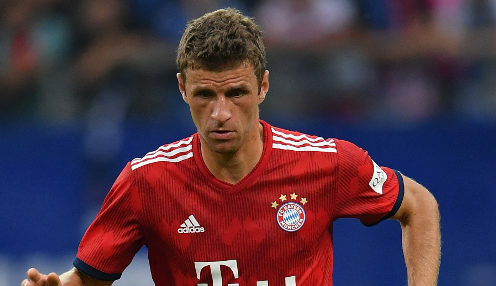 Bayern Munich forward Thomas Muller thinks the Bundesliga title momentum lies with his side after they drew level on points with leaders Borussia Dortmund. Bayern roared to a 5-1 victory at Borussia Monchengladbach on Saturday evening, having seen Dortmund lose 2-1 at Augsburg a day earlier. The momentum is on our side and it starts from scratch now. Those results left the two sides locked on 54 points each with 12 games to play, with Bayern having won their last four while BVB have dropped seven points during that time. And Muller is clearly bullish about the prospects of a seventh consecutive German league title. He told his club's official website: "The momentum is on our side and it starts from scratch now. In the winter we didn't think we'd catch up like this - we're clearly in better shape than in the autumn." Bayern are now available at 1/6 to be crowned champions of Germany this season, with Dortmund priced at 4/1. Meanwhile, Die Roten head coach Niko Kovac was delighted with his side's performance against Monchengladbach, adding: "That was the best we have played in the Bundesliga this season. "Now everything is open again. The title does not become a matter of fact, because we still have some tough games ahead of us, but we are motivated enough to achieve that. "The team are doing really well, we have a good atmosphere and the team have desire."